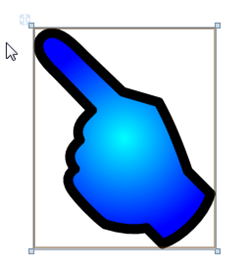 I wanted a custom cursor for BabySmash! My son was having trouble associating the mouse cursor on the screen and the movement of the mouse. Clearly a shiny new Kids Cursor was in order. 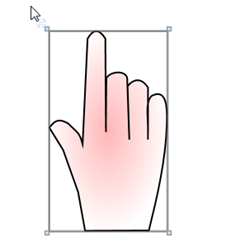 I went into Expression Blend and drew this hand cursor. I drew it with the spliney-liney pully-thing-tool. (That's the official name for it, I'm sure. I was feeling pretty good about this cursor. It had a gradient and everything. I put it up, but mentioned to Felix The Designer that maybe he wanted to have a go at making a cursor. Seven minutes later I received this. If you want to understand what real design talent is like, read about Felix's thought process as he redesigned the Mix site. More on the Designer/Developer relationship later, but for now, thanks to Felix and Conchango, BabySmash is looking pretty professional, IMHO. I couldn't agree more - my site designs are always "technical" looking and never can compare with a real designer. Actually I preferred your attempt! Any chance you could get the drawing working across monitors? Well, yes and no. The problem with drawing across monitors is have "MouseCapture" on for drawing. I need to detect they've hit an edge and give up the capture, notice where they are headed and then turn on capture. Or, I need to do drawing without using the capture features. I still believe you can be good at both, but being good at one does not in any way make you good at the other. I actually argue something different: on a big project, I try to find a type of software team member that do both well. Untrained developers tend to make ugly and/or dry UIs. Nonspecializing designers tend to make interfaces with too much gradients and other "bling". In your example, I think the blue finger is downright annoying. C'mon, does everything a designer touch have to have a friggin gradient?!? Really? Hm. I like the blue finger. Too blue for you? Too fingery? Too what? Maybe I'll make gradients an option. designers are not needed as much as they think they are. users will go to a site if it has good content even with bad graphics. a pretty site with bad content will be featured on a look-at-this-cool-web-site and never be used. your designer's graphics are actually very easily done. most developers don't take the time to learn something like photoshop. you don't have to be that creative. only basic principles are needed to do most of the graphics on the web. i know because some designer said i couldn't do his job, so i learned photoshop. needless to say i'm not so easily impressed by eye candy anymore. the web should be about usability not eye candy anyway. the big boys know that: google, yahoo, linked-in, craigslist ... users understand that too. Gotta say I like the blue one, but that's probably because I'm a lefty. Otherwise, I'm rather impressed by Scott's implementation. Sure would take me a while, and I'm the UI guy at my company. Working on the UI for an application only requires design skills if visual styling is an important factor. If it is, hire a designer or train yourself, as pat mentions. Otherwise, a programmer working on UI should approach the interface much like an Industrial Engineer would approach any problem: Minimize the steps, provide the most intuitive interaction. - To cop from Scott: Design != Graphics. A good web/software designer would know usability issues, common interface/UI patterns, etc, on top of mad Photoshop skillz. This is where having a pure "designer", misunderstood as meaning a graphic designer, on your team just results in bling without substance. - Given a choice between graphics and content, content should obviously win. However, that is a strawman argument; they are not mutually exclusive choices. And, to be honest, technically-minded developers are those prepare to setup such an argument, then drop the designer. One should strive for good content, good design and some graphic sizzle, esp. in a commercial product, if you want to attract the widest audience. I've actually been struggling with this exact thing. I'm an application developer by trade, but I've been working on a website for my dad's business, and man...I can definietly attest that I'm no designer. They just have an eye for things I can't quite grasp until they show it to me, then I'm like "Wow..."
I think what makes Felix's graphic "better" is that it is a much closer representation of the actual concept Scott is trying to model - pointing at something - than Scott's "hand holding an invisible mouse" graphic. Particularly because this app is for young children where even a small thing like that can make a big difference. We all learn around the age of one what a pointing hand looks like. It isn't until several years later that we figure out that Scott's graphic is a hand using a mouse. Not that Scott's doesn't get the point across - especially if your > 6. But Felix's is closer to real life and that helps toddlers (and adults) transfer their "real world" skills/concepts to a digital world much better. Where does one learn to be a "designer"? As a developer, learning programming is quite linear: learn a language, learn a tool that understands that language, decompose a problem, write a solution. Design seems much more esoteric. I've looked at design books like I look at programming books, seeking concrete answers (or partial answers) to problems. When I look at design books, the examples look pleasing and well-designed, but they're not really a "solution to a problem". I want to improve my design skills, but I'm a bit frustrated and not really "getting it". True that a designer brings a style to a project that a non-designer does not. But I think the more important question is the one that BrianE raises. How do we convey the use of the application to its intended audience? Does a toddler respond better to a hand than an arrow? Is there another shape that works better? Perhaps another metaphor altogether, like BabyTouch? These are the questions that should be asked about every software project. Someone on the team should own this responsibility. That is what Alan Cooper means when he talks about a designer. Sounds like an Interaction Designer! couldnt help but notice that the Hand used by the designer is actually from one of the fonts that you can actually use in babysmash. here is a problem that i found when trying to open the options while using transparence. follow link for screenshot. by the way my daughter loved to play this game, my partner though it was a great idea and if you need any help coding anything let me know. I completely disagree, it is just a stereotype ;) I am primary a developer, but I could say for myself that designer && developer. Yes, in most cases this is true, but having a knowledge and talent for one of them doesn't necessarily excludes the other. The problem I got is having lots of ideas to create sites, the ability to code them, but lacking in the design department to put nice UIs against it. 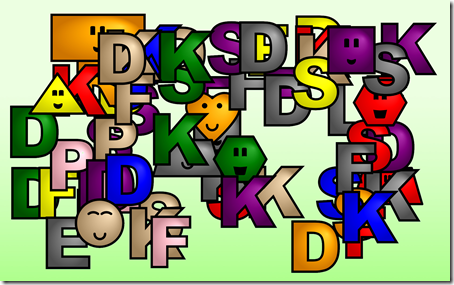 Function and beauty are equally important in any web or interactive application. You'll lose just as many people on a pretty site that's difficult to use as you will on an ugly site with good usability. I think any programmer who says that designers are unnecessary are just as naive as designers who say programmers are unnecessary. You can't successfully develop a complicated application without both. As always, when developing a site or application, the focus should be on your users: Consider your audience and the purpose of the site, and build accordingly. Are most of your users engineers or artists, teenagers or senior citizens, or any of the other million classifications of people groups? Are you simply sharing information or are you trying to build a brand and sell a product? What impression do you want your users to leave with? Eliciting a "Wow I found that phone number fast" reaction requires a much different approach than getting a "Wow they're hip" or "I really want to buy that cell phone/dress/widget." As for me, I consider myself a hybrid: I'm a designer at heart, which to me means that I have an "eye" for what visually works and what doesn't. It's not something I learned - it's something that comes naturally to me. I'm married to a programmer with mad skillz and so I've picked up enough programming know-how to be self-sufficient, though it's certainly not something that comes easy for me. I've designed and built enough projects that I have an intuition for what works and what doesn't. I hate building sites designed by people who have never touched html before, because they don't have that intuition about things, and it takes twice as long to hack the code into working. I use Photoshop to edit my photos, but I don't use it to design my web pages; I'm more of an Illustrator girl myself (using those Bézier curves you were talking about, Scott). I agree that there are way too many gradient-happy designers out there - I work with a few of them. All in all, I know that I'm mostly a designer: I have a high level of respect for good programmers because I know that their analytical mind is much, much better at solving my coding problems than I will ever be. Likewise, I like working with programmers who acknowledge that I'm good at what I do and they're not: That's a healthy working relationship. In my opinion, either one who says "I don't need the other" is either misinformed or just plain cocky. That’s my two three cents. I'd say that Scott's icon is better, it's a closer representation of the real life object i.e. the hand and therefore the child is more likely to understand what it's for. The blue icon may look nicer, but in terms of usability it's only slightly better than the arrow pointer as it still doesn't have much in common with a real life hand. I have to agree with Duncan. What you want is a visual drawing that is as close to real life as possible, not a highly stylized shape that is meant more to impress than is to inform. Blue finger is better mostly because the first attempt looks like it's giving us "the finger" (with the index finger).